When a grandparent holds their newborn grand-baby for the first time, there’s an emotional high that’s almost beyond description. The wonder and love felt at that time is forever remembered with a smile. You feel a new and different kind of love towards this sweet, innocent, warm baby…a new level of love. It’s magical and joyful! Why a different kind of love? You suddenly get this feeling of immortality and the comfort that somehow, some way, a part of YOU will live on through this precious little one. As a modern-day grandparent what role do you play? Grandparents have always played an important role in family life; the historian, the mentor, a role model, a friend. However, over the last twenty years, grandparents have had increased responsibility for their grandchildren due to changes in society and a larger number of single parent households. These responsibilities might include activities such as getting young children ready for school in the mornings, providing full-time child care for preschoolers, or serving as a custodial parent. As a grandparent, in this modern-day family, your role is unique and important. You are not just “another babysitter,” but have a fundamental connection with your grand-kids. Make the most of those special days! 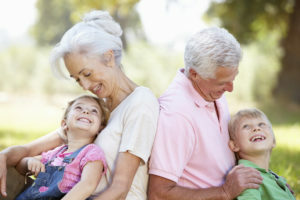 Grandchildren bring energy, laughter, optimism, love and purpose to the lives of their grandparents. While grandparents act as an authority figure and provide unconditional love, they also wield incredible influence and get to spoil their grand-kids in a way parents simply can’t. I encourage you to keep the connection active and alive no matter what the current circumstances may be. Let your imagination go wild, make it a point to send colorful cards or magazine gift subscriptions. Utilize technology and keep that link going through Facetime, Skype or old fashion telephone calls. The bottom line is to keep the constant connection with your grandchildren. Everyone is blessed because of it! What influence do you have on the younger generation? Are we the lucky ones?